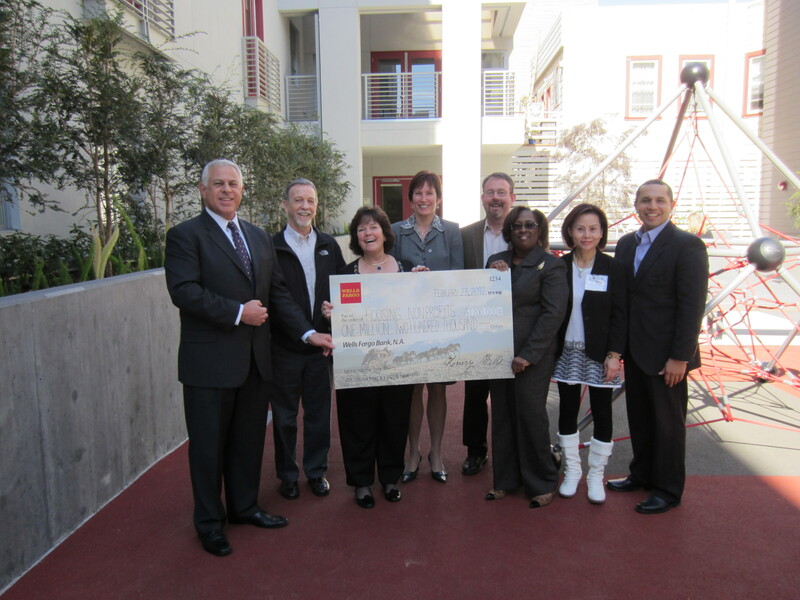 Wells Fargo will announce grants to 20 housing nonprofits across California at Mercy Housing’s Westbrook Plaza in San Francisco, Calif.
Mercy Housing California is extremely pleased to announce renewed and increased support thanks to a $150,000 grant from Wells Fargo. The grant was awarded as part of Wells Fargo’s Welcome Home program. The funding will support Mercy Housing California’s new affordable projects in development in 2012. The lack of affordable housing is one of the biggest economic challenges facing low- to moderate-income families and seniors in California. A family that spends much of its income on housing has less money for food, clothing, health care and other basic needs. Mercy Housing California has demonstrated its expertise as an affordable housing real estate developer, a commitment to sustaining and revitalizing communities through extensive outreach, advocacy and successful collaborative partnerships with organizations like Wells Fargo. Wells Fargo & Company (NYSE: WFC) is a nationwide, diversified, community-based financial services company with $1.3 trillion in assets. Founded in 1852 and headquartered in San Francisco, Wells Fargo provides banking, insurance, investments, mortgage, and consumer and commercial finance through more than 9,000 stores, 12,000 ATMs, the Internet (wellsfargo.com and wachovia.com), and other distribution channels across North America and internationally. We want to help all of our customers succeed financially and create long-term economic growth and quality of life for everyone in our communities. In 2011, the Company invested $213.5 million in grants in 19,000 nonprofits, and team members contributed more than 1.5 million volunteer hours around the country. For more information, please visit: www.wellsfargo.com/about/csr. Mercy Housing California (MHC), the largest regional division of Mercy Housing, is a recognized leader in the development of quality, affordable housing. Our properties serve low-income families, seniors and people with special needs including the formerly homeless, people with disabilities and people living with HIV/AIDS. Mercy Housing California maintains offices in San Francisco, Sacramento and Los Angeles. Through the provision of safe, decent service-enriched housing, MHC strives to strengthen families and build healthy communities. For more information please visit our website at www.mercyhousingcalifornia.org.